The first meeting of the 2013/14 season featured an illustrated talk given by the President of the Society the well-known local historian Jude James, whose subject was, ‘Hurst Castle 1870-1920’. Jude introduced his talk by giving a brief outline history of Hurst Castle saying that it was one of a number of forts built during the sixteenth century, which were constructed at strategic points along the coast specifically to deter the threat of foreign invasion. During later years, as the threat of invasion receded, the castle suffered from neglect and disrepair. But by the later part of the eighteenth century there was the threat of invasion from by Revolutionary France. 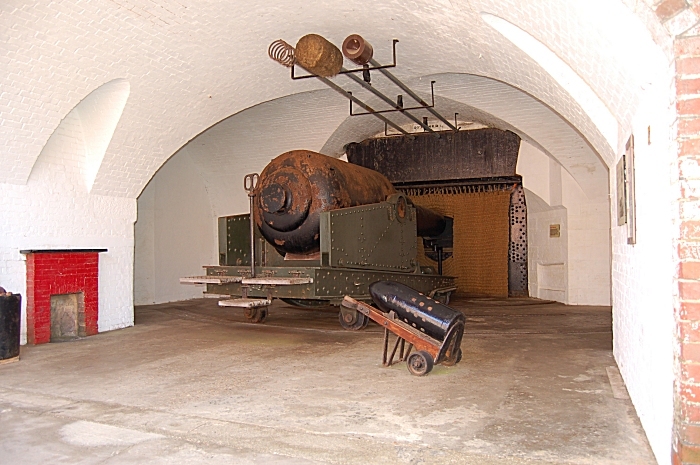 This led to the castle being refortified with the addition of larger guns mounted in external earthen batteries on either side of the original fort. While the original Tudor castle was also reinforced with additional brick walls and equipped with larger cannon. At the same time complementary defences were erected across the Solent, on the Island, to maximise protection of the mainland. The defeat of the French at Waterloo removed the threat of attack and Hurst Castle again became quiescent. In 1786 the first of Hurst’s two lighthouses was erected by Trinity House and cottages were built to house the keepers’ families. In 1822 the recently formed Coastguard Service established a base on the Spit. Later, the coastguardsmen were accommodated in a terrace of brick cottages and provided with a communal wash house and boat house. These buildings survived until the late 1980s. Earlier, cottages had been built to house the families of the lighthouse keepers. An Inn, called the Shipwrights’ Arms, had existed on the Spit for many years serving the needs of the small community comprising the castle garrison, the lighthouse keepers, itinerant workmen, coastguardsmen, local fishermen and casual visitors. In due course this was superseded by the Castle Inn which functioned until 1916. The building of a telegraph station at Hurst in 1854 was an important initiative. The cable running inland was laid underwater to Keyhaven and then by way of Lymore Lane and Milford Road to join with the main telegraph system at Lymington Railway Station. It was also linked to Osborne House on the Island to provide contact with the Queen. Although the service brought almost instant information in respect of national events its main function was to provide intelligence about ships sailing to Southampton and Portsmouth and this role continued to be of importance into the early twentieth century. However, by the mid-nineteenth century there were again fears of a possible French invasion and from about 1860 plans were put in place to rebuild all Portsmouth’s western defences. In this scheme Hurst Castle was regarded as the lynch pin. So began the massive rebuilding of the fort which took place between 1860 and 1873. This massive enterprise required a large workforce comprising many skilled workmen, including bricklayers and carpenters who were housed in Milford, Keyhaven and Lymington. The fort today endures as a monument to their skills. Using many fascinating stories and anecdotes, the speaker described the daily life of this small community on the Spit. It was interesting to learn that in the late nineteenth and early twentieth centuries there were two daily collections and deliveries of mail (including Saturdays) with one collection and delivery on Sundays. The War Department’s launch made four daily visits with supplies. All this activity, together with occasional visits from workmen and others it became apparent that the spit was a busy, active settlement. The Spit had its own school until 1905 and it is easy to see how the children living there came to love the place and find almost inexhaustible fascination with the life going on around them with soldiers, lighthouse keepers and coastguards ever busy with their duties. Religion played an important role in the lives of the community and at one time the parish of Hordle, in which Hurst Spit fell, provided a chaplain to serve there. The coming of war with Germany in 1914 led to many changes at the fort. The garrison was required to defend the castle against possible land based attack and complex barbed wire defences were erected on the surrounding beaches. Searchlights and modern quick-firing guns were installed. The castle was decommissioned in the 1930s only to be recommissioned in readiness for the possibility of invasion during World War II. It is now owned by English Heritage and is a popular attraction for both tourists and local residents. The talk demonstrated Jude’s deep knowledge and enthusiasm for the subject and was very much enjoyed by a large audience. The next meeting of the Society will be held on Friday, 25th October, starting with a short AGM and followed by an illustrated talk entitled, ‘The New Forest Remembers – Untold stories of WW2’ given by Mr Gareth Owen.